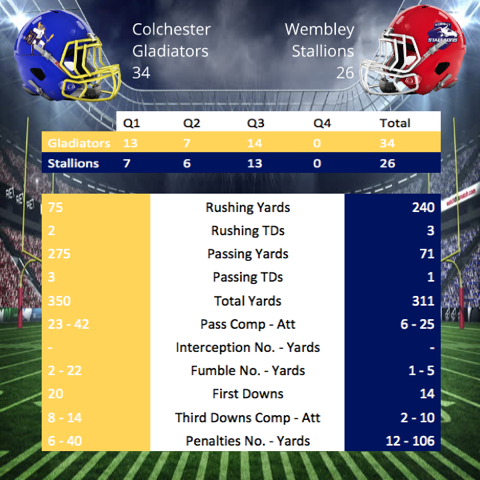 Wembley Stallions lost 34-26 at Colchester Gladiators in their first game in Division One SFC East. It is the first time in Stallions’ history to lose a season opener. The home side started strongly, gaining a two score lead. The Stallions dug deep to get back into the game, levelling the score in the third before the Gladiators pulled ahead again and held firm to record the win. Stallions received the kick-off after Gladiators deterred to the second half. The away side suffered on the first drive, Junior Ejehu slipped after being handed the ball losing two yards. Quarterback Junior Price scrambled to half a yard shy of a new set of downs on second down. Whilst Ejehu found his feet on the next play, a penalty for a push in the back sent the Stallions backwards. No yards were gained on the subsequent play, meant the punt team were sent on. The home side started their drive at halfway; a few throws later and they were just four yards away from the red zone. A penalty against the Stallions’ defence for being offside and another throw put them just eight yards from the end zone. A tackle by Rickell Ricketts prevented a touchdown, then a tackle started by Will Flaim and finished by Johann Johnson prevented another attempt at a touchdown. 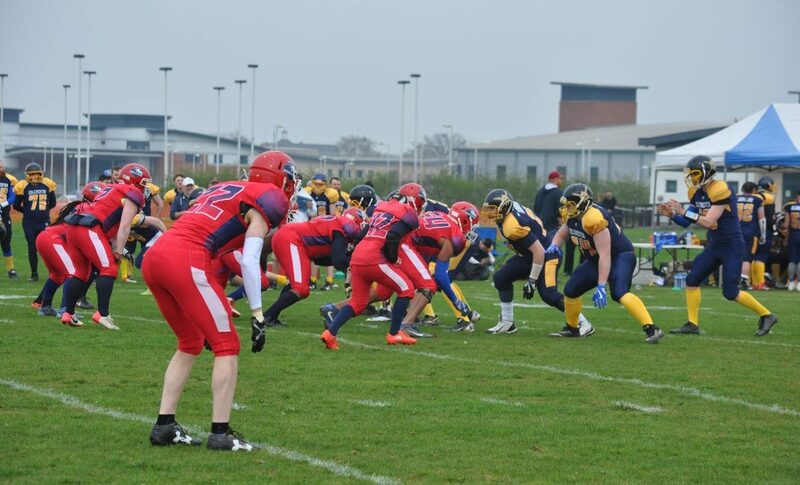 However, the home side were not to be denied, on fourth down using play action the Gladiators threw for the first score. The extra point was missed wide so the score was 6-0. On the kick return Aaron Greenidge put the Stallions in great field position, close to the halfway line. Runs from Ejehu and Daven Abrahams put them just into Gladiator territory. But a pass attempt battled down at the line of scrimmage sent the punt team on again, for the Stallions second straight three-and-out. Further problems arose when a high snap was seized upon by the Gladiators, setting themselves up just outside the red zone. The home side mixed this drive up with a run and a pass to put them inside the ten-yard line. Another penalty against the Stallions’ defence for being offside, added five yards and the Gladiators were able to run in for a touchdown. A successful kick put the score at 13-0. Stallions not deflated, returned to their powerful run game, handing the ball to Ejehu on the next drive to position them near halfway. Ejehu was handed the ball on the next play and ran in a 53-yard touchdown. A penalty for delay of game on the extra point pushed the attempt back five yards, but Nick Glenday was able to slot the ball through the posts, making the score 13-7. Gladiators stuck with the passing game, progressing up the field despite Jacino Christie and Johnson putting pressure on the quarterback and Ricketts put in another great tackle to stop the receiver in the backfield. However, the drive continued over halfway as the quarter ended. 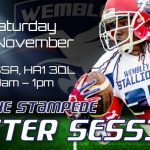 The second quarter started how the first ended, with the quarterback evading pressure from Christie and completing a pass down field, a tackle by Duncan McAslen stopped the receiver at the Stallions’ 34-yard line. A short run and a pass put the home side just a yard from another touchdown. A mass tackle and a penalty for illegal formation delayed the score, but another pass and a successful kick returned the Gladiators to two score lead at 20-7. The away side switched up their play on their next drive, starting with the run with Ejehu and Emmanuel Olagbaju, they also threw benefiting from a penalty for pass interference to progress down the field. However, a successful catch by Greenidge and a short run from Ejehu failed to move the sticks so the punt team was sent on. A fake punt on fourth down failed so the Gladiators took over. Stallions held the home side to a quick three-and-out with the Gladiators adding pressure on themselves with a penalty for a false start. The away side went back to the running game with Ejehu, a fumble recovered by Olagbaju kept the ball in Stallions’ hands. A failed pass attempt put Stallions at third-and-long; as the punt team got ready Ejehu was handed the ball and broke out a 63-yard run for a touchdown. The extra point was blocked making the score 20-13. Gladiators continued throwing the ball; a mass tackle started by Martin Dwamena stopped the receiver at a two-yard gain. Johnson continued to pressure the quarterback, but the passes were still completed. A strip by Sam Fraser could have levelled the game, but forward progress had been called so the home side continued. A penalty for pass interference kept their drive alive as they neared the red zone, but some failed pass attempts, AJ Adibode batting the ball down and Luke Streeter and Johnson getting pressure on the quarterback; the away side took over on downs at the 21-yard line. With only 32 seconds left in the second quarter, the Stallions tried to gain ground, but a tackle from Seb Pettican only just prevented a pass interception, then a penalty for an illegal block on an Ejehu run, pushed the Stallions back. So the home side saw out the clock to go in at the half with a score line of 20-13. The home side started the third quarter with a run; Stallions’ Danny Hounslow made the tackle in the backfield for a five-yard loss. Gladiators then made a lateral wide pass on second down; Fraser timed his strip right this time and ran in for a touchdown. Glenday kicked the extra point to level the score at 20-20. Gladiators unfazed returned to the field, running and passing the ball as moved down field. Penalties came against both sides on the drive, but two against the Stallions for personal foul and pass interference put the home side at the goal line. Gladiators restored the lead with a running touchdown and a successful extra point to put the score at 27-20. Stallions fought back as they moved up the field quickly on their next drive with runs from Ejehu. A throw to Brett Parnham brought a new set of downs, then runs from Ejehu and Geraldas Kastauna put the away side at the 26-yard line. 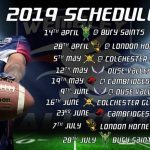 Lewis Key caught a 26-yard pass for a touchdown; the extra point was wide so the Gladiators remained in the lead at 27-26. The home side stuck with the passing game as the moved again down the field. Tackles on the receivers came from Pettican and Henry Young, but Gladiators again extended their lead as they threw for another touchdown. With a successful kick, the score was 34-26. Stallions ended the quarter with Ejehu making a 12-yard run to start the fourth quarter with a new set of downs on the 39-yard line. The home side were unable to gain enough yards to continue the drive so the punt team were sent on. 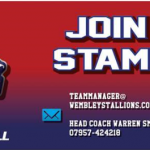 Gladiators failed to catch the high punt, Ian Stewart reacted fastest, pouncing on the ball to turn the ball back to the Stallions at the 46-yard line. A catch from Carl James and another run from Ejehu got the away side over halfway. However, a penalty for a push in the back put them back at midfield and runs from Eheju, Greenidge and a scramble by quarterback Price were not enough to extend the drive. Stallions’ defence continued to pile on the pressure as they forced a quick three-and-out, with tackles made by Ricketts and more pressure on the quarterback from Piers Watkins. Abrahams took on the Stallions’ running game on their next drive, getting them across halfway. But the drive stalled at the 34-yard line. A failed pass attempt on fourth down meant the Gladiators returned to the field. Gladiators suffered another quick three-and-out as three pass attempts failed to reach their mark. Stallions were unable to more the ball far on their next drive, a short pass to Krystian Czadowski followed by two failed attempts brought on the punt team and a quick three-and-out. The home side returned to the running game as time neared the end. Taking as much time of the clock as they could, Stallions’ defence held firm to give the offence one last chance. The away side made a great start in their next drive throwing for 33 yards to Greenidge to near midfield. But a penalty for a false start and further failed pass attempts lead to the Gladiators returning to the field to take a knee and end the game at 34-26.